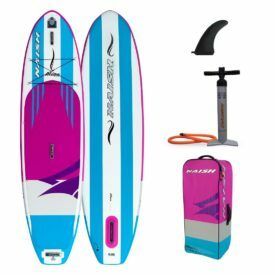 The 2018 Starboard 11’2″ Blend Zen inflatable stand up paddle board is improved and upgraded for this year. 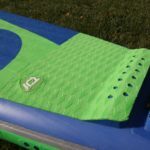 With thicker drop stitch, Dual Stringers on top and bottom decks, supported standing area, rail stiffening strips and improved bag, the Zen model boards inch ever closer to the Deluxe model construction and features but maintain their lower price. 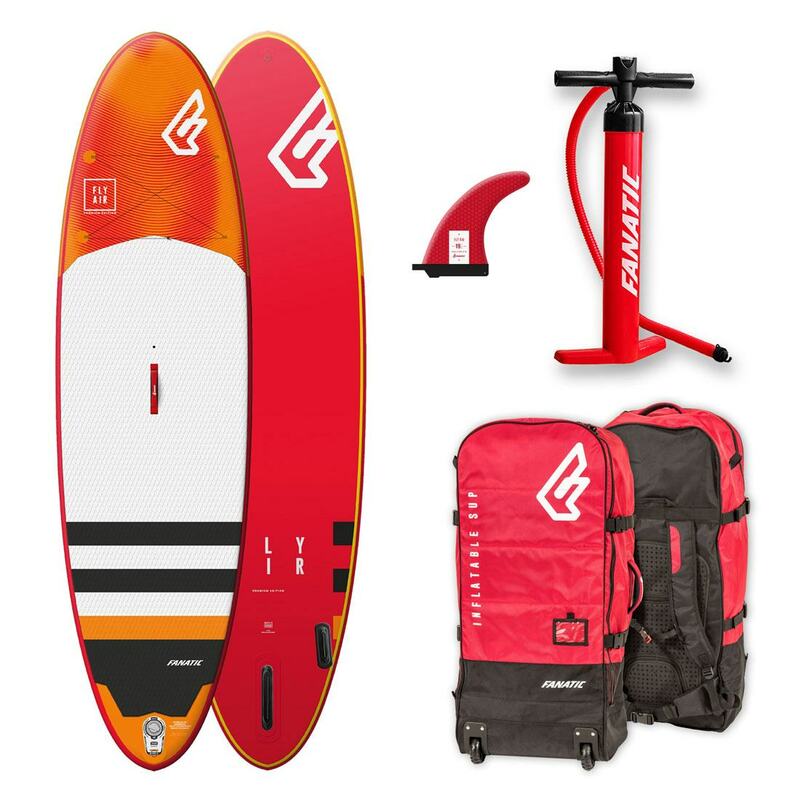 The 11’2″ Blend Zen is the ultimate transportable flatwater-to-wave crossover. 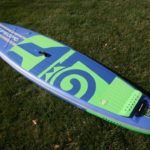 The 2018 model is now 5.5″ thick, up from 4.75″ of last year. 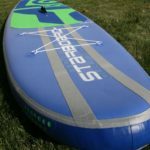 In combination with higher than average inflation pressures (up to 18 PSI) for inflatable SUPs at this price point, this vastly increases overall stiffness and improves performance and carrying capacity. 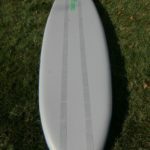 The Blend has a moderately wide nose for increased stability, a straighter outline and slightly pulled in tail area for a smooth and efficient glide. 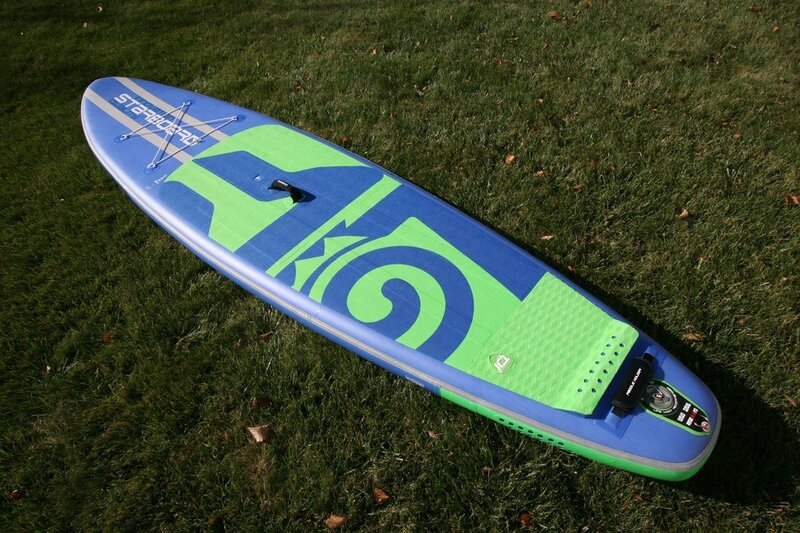 The 32″ width offers a stable and forgiving ride, while maintaining a good top speed. 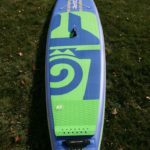 This article is a review of the 2018 11’2″ Blend Zen and not necessarily an instructional or how to article. 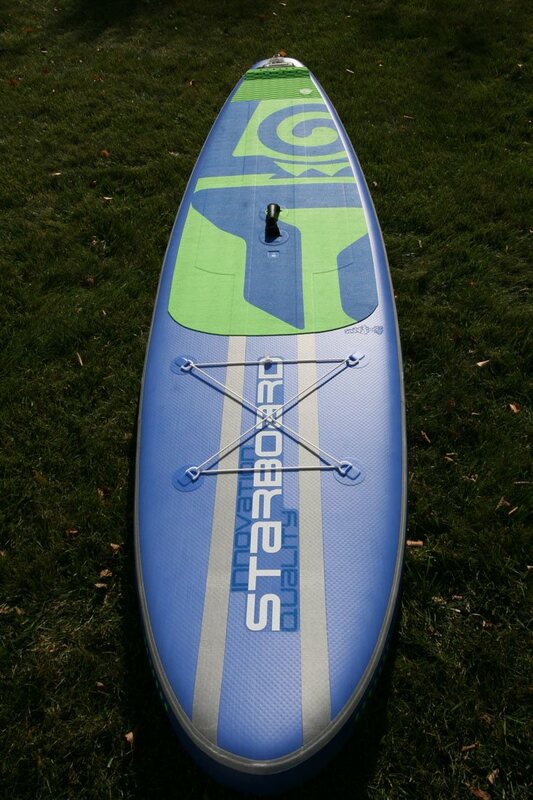 For that we suggest you view the Starboard Inflatable SUP Manual (1MB) or this article. 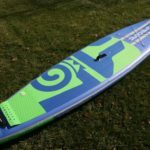 TL;DR: The increased thickness of the 2018 inflatable Blend, combined with the new and stiffer Starboard Zen technology, has given this board a significant improvement. 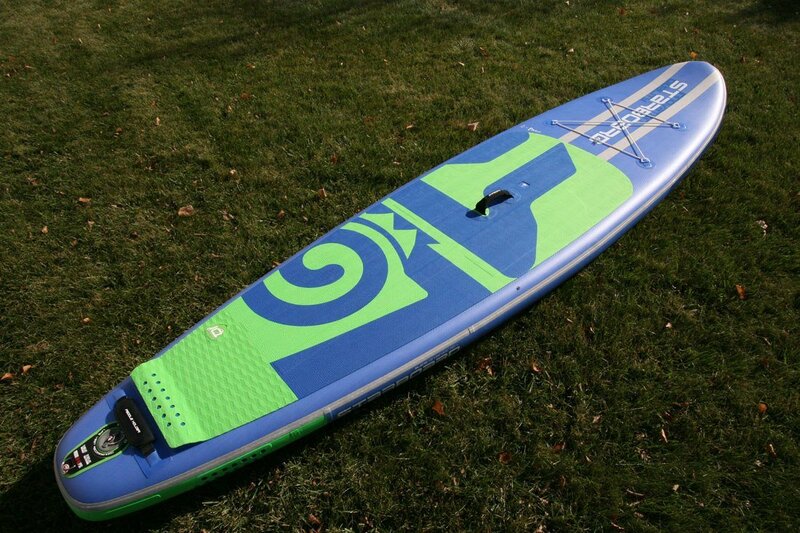 The 11’2″ length provides excellent glide, while the 32″ width provides excellent stability. 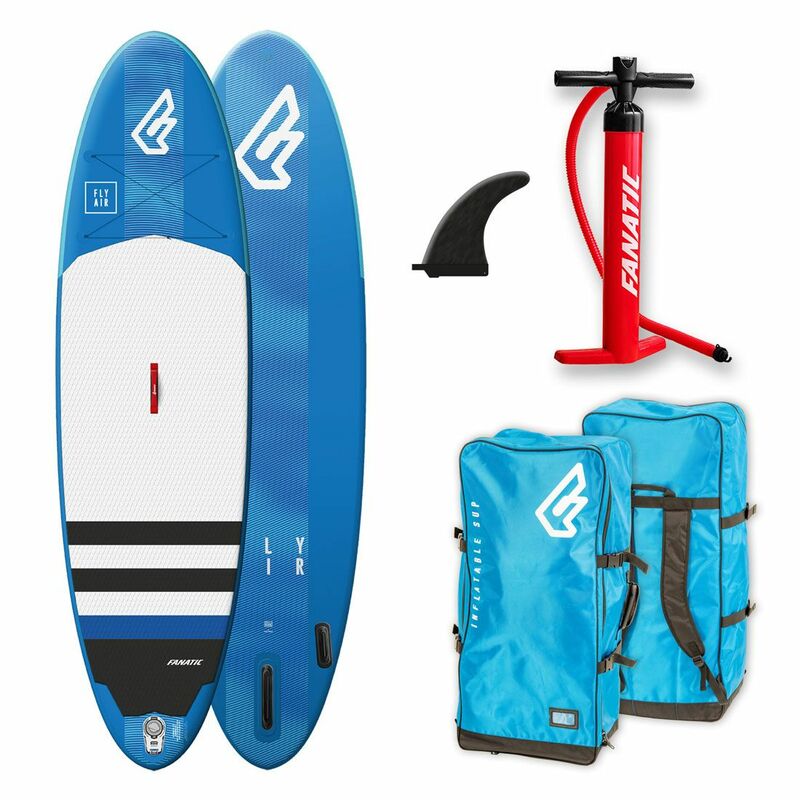 The Blend Zen is a great flat water to all round to wave cross over board, it is the ultimate travel companion at an exceptionally good price, especially when you consider other brands at this price can’t match the quality or performance. 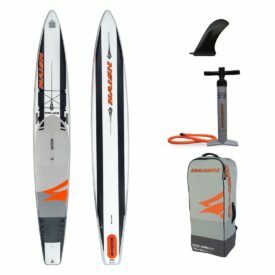 Well the biggest change in the Starboard Inflatable Zen range for 2018 is the increased thickness of drop stitch on some models. 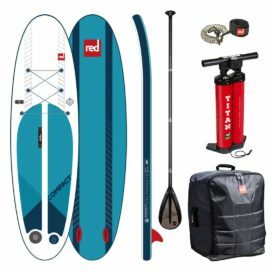 Previously they were 4’75” thick, and now are 5.5″ thick, the 2018 Blend included. 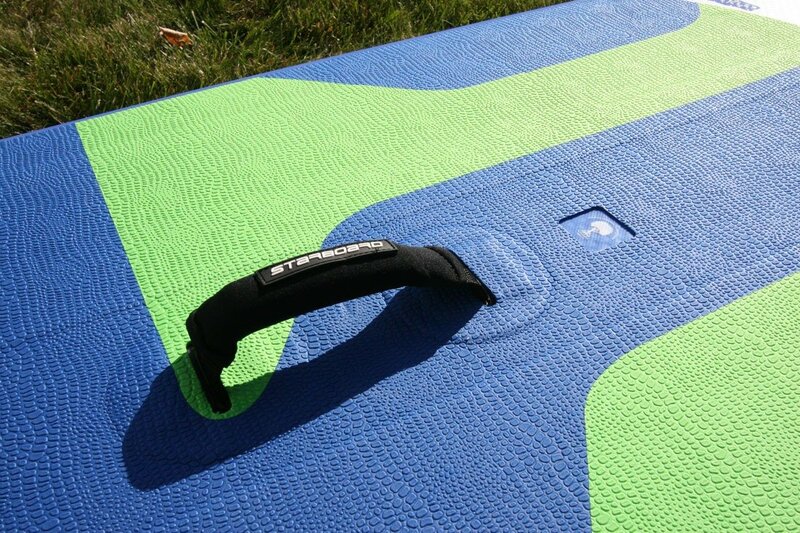 Our lightest board construction, ZEN, is now stiffer and comes with reinforcement plates in the standing area. 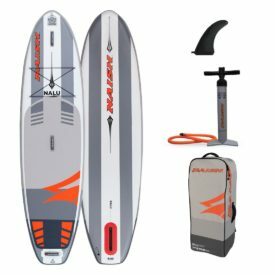 The fixed fins make the board tool-less and easy to prepare for on water action. 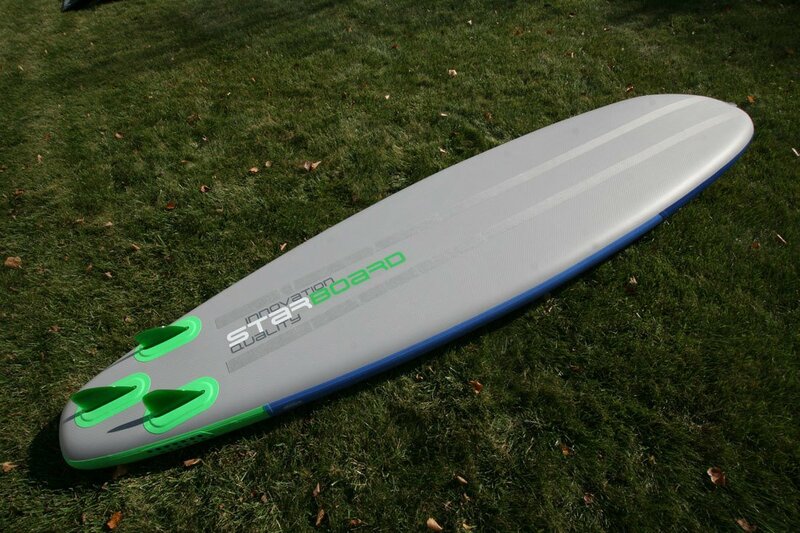 By carefully nesting the reinforcements Starboard offer the lightest board they have ever produced. 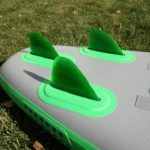 The large soft thruster-fin set up is a proven and durable tracking solution. 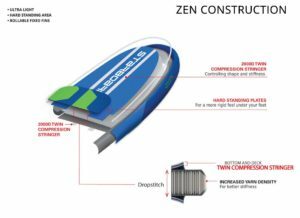 A very light board: Re-engineered Zen technology: more fibres, less coating and optimized glue usage. 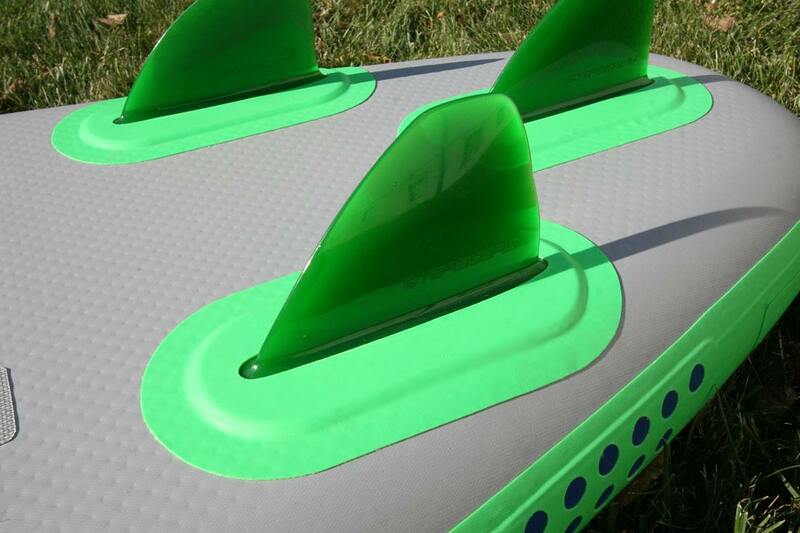 On the water you will sense the acceleration and fun feel of a light hull. 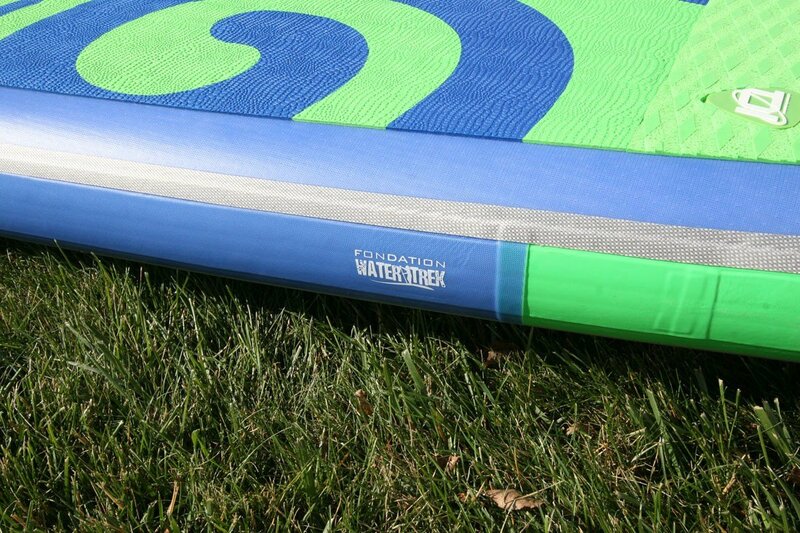 A great sensation while paddling: The triple-sandwich rail laminate acts as dual stringer stiffeners and also make the rails incredibly strong. 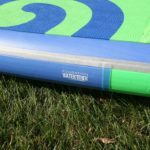 We replace double PVC layers with twin 2000 denier deck and bottom stringers, providing the board that rigid, crisp and stiff feel. 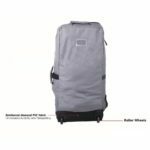 Visually very similar the the 2017 Magic Suit Case, the Re-Cover Zen bag is now much lighter, with improved zipper access and lighter duty but better rolling wheels. 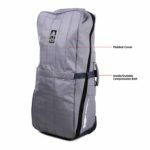 While the bag is overall noticeably lighter, they have not skimped on any of the important details. 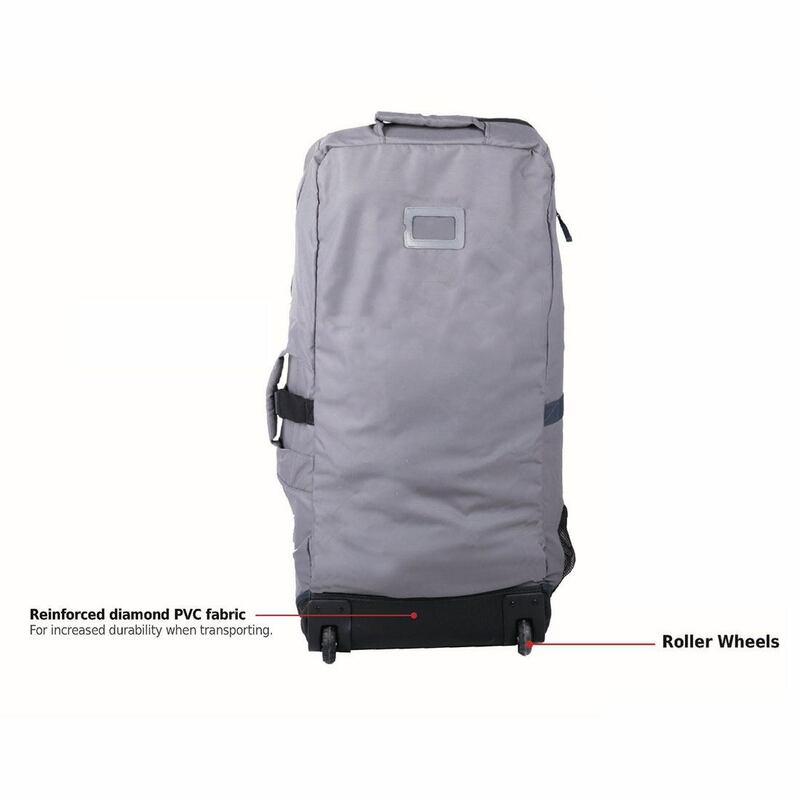 You still have the roller wheels, internal pocket, compression straps and name tag window. The V8 Double Action Pump carries over from 2017. 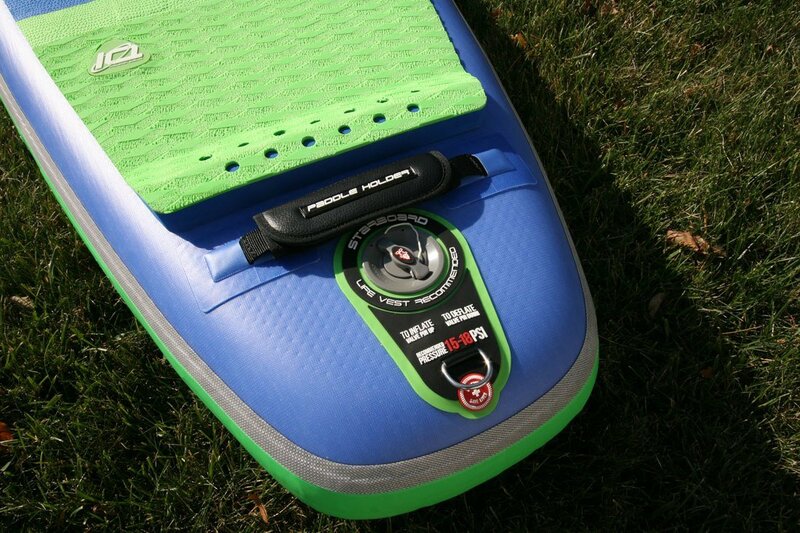 A running change throughout the year will mean the pump will arrive in black instead of blue. 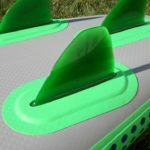 This is a change made by Starboard who are now doing everything they can to minimise their impact on the environment while still producing market leading products. 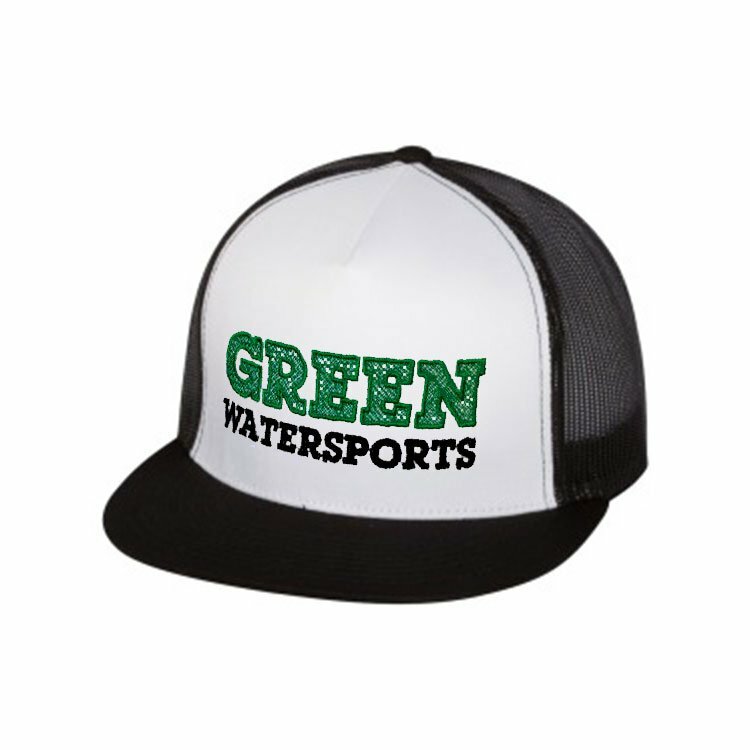 The black color is a result of recycled plastics going into the pump. 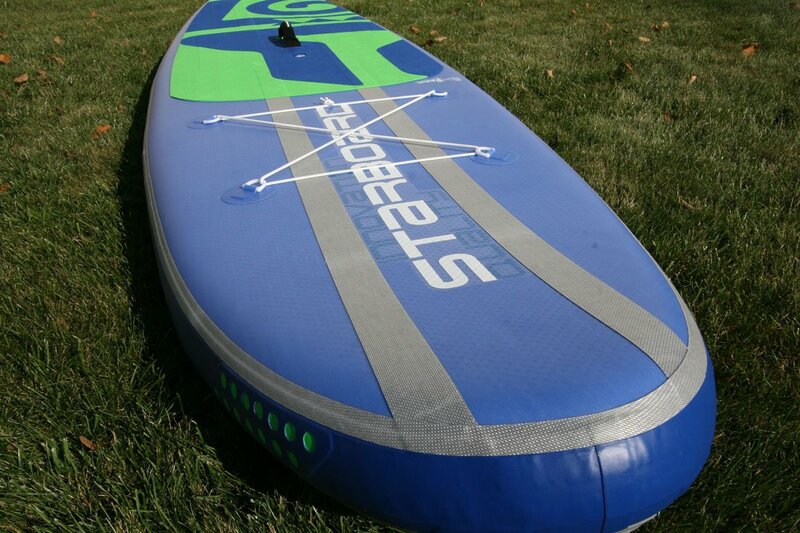 The V8 Double Action Pump is top quality and makes inflating any board a breeze. 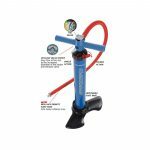 Start pumping in the double action mode, as controlled by the little red lever, and you’ll inflate on both up and down strokes. As the pressure mounts, pulling up requires more effort than is comfortable so you switch to single action mode. 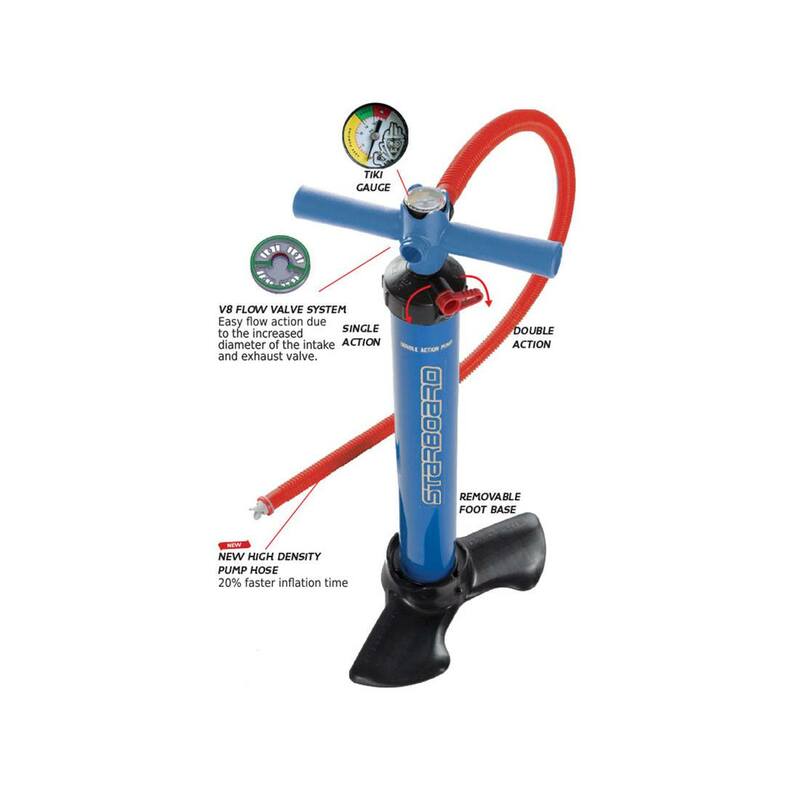 Flip the red lever over and continue pumping to 15-18 PSI. 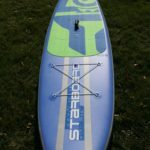 Inflating the 2018 Starboard 11’2″ Blend Zen to 18 PSI took me about 3 minutes and 40 seconds. 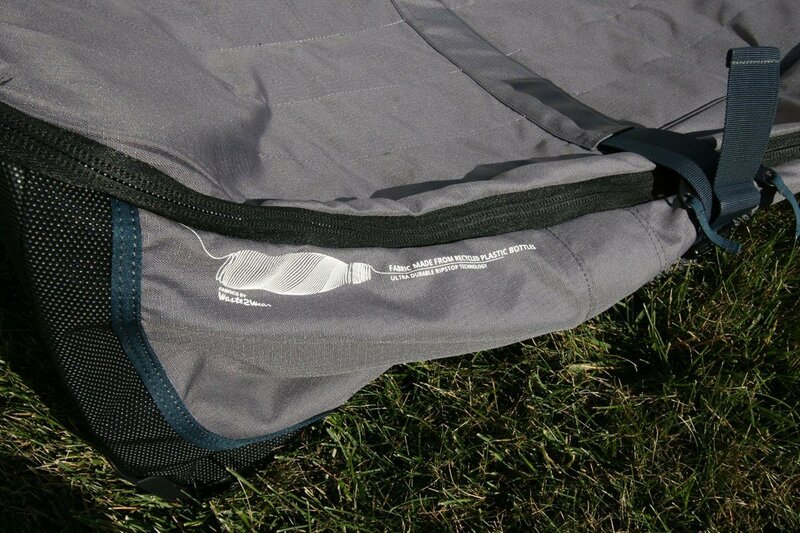 Add another few seconds to make sure you leash is secure, and you’re good to go! 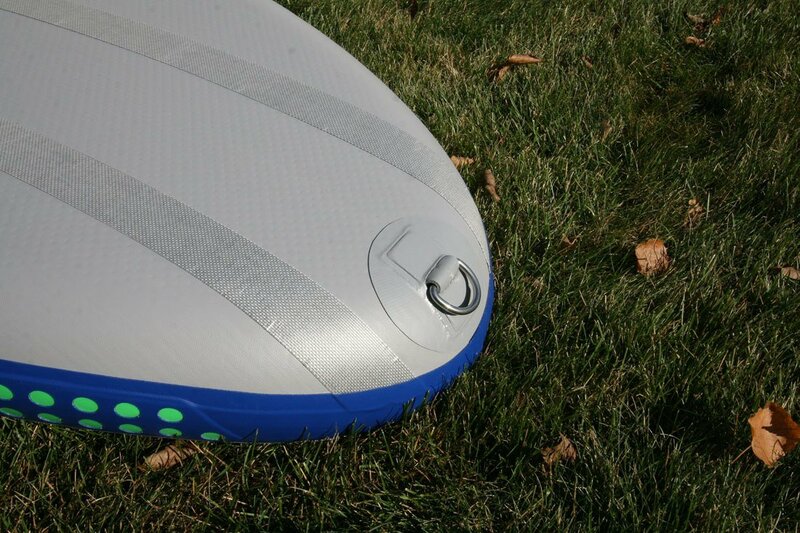 I always like to inflate the boards to their maximum. 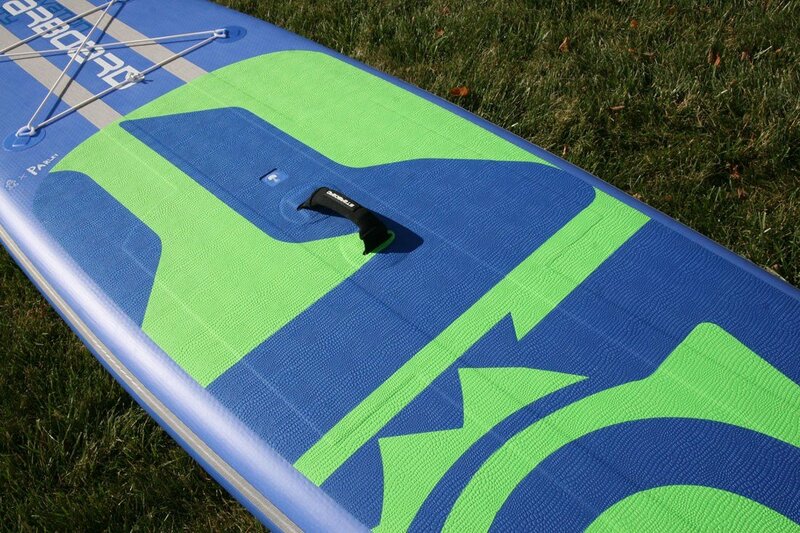 Higher pressure means a better performing board. 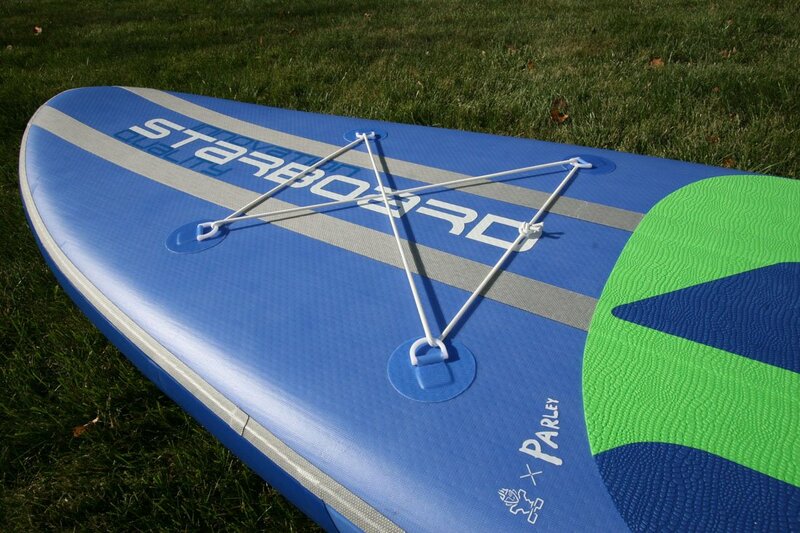 See more on the Starboard Inflatable SUP Manual (PDF). 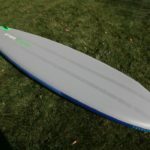 Dimensions: Almost the same as previous years, the 2018 Blend Zen is 11’2″ long, 32″ wide, but now 5.5″ thick. 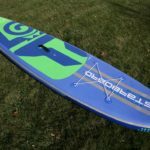 The change from 4.75″ to 5.5″ thick is the most notable physical change, and one that has a noticeable effect on the performance, versatility and usability of this board. This new, thicker, Zen construction also uses more fibres and optimizes glue usage for a stiffer, yet lighter board. 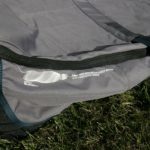 Below you can see the double Denier stringer strips, up from the single PVC stringer strip. You can also see the ever so slight rounding of the nose. 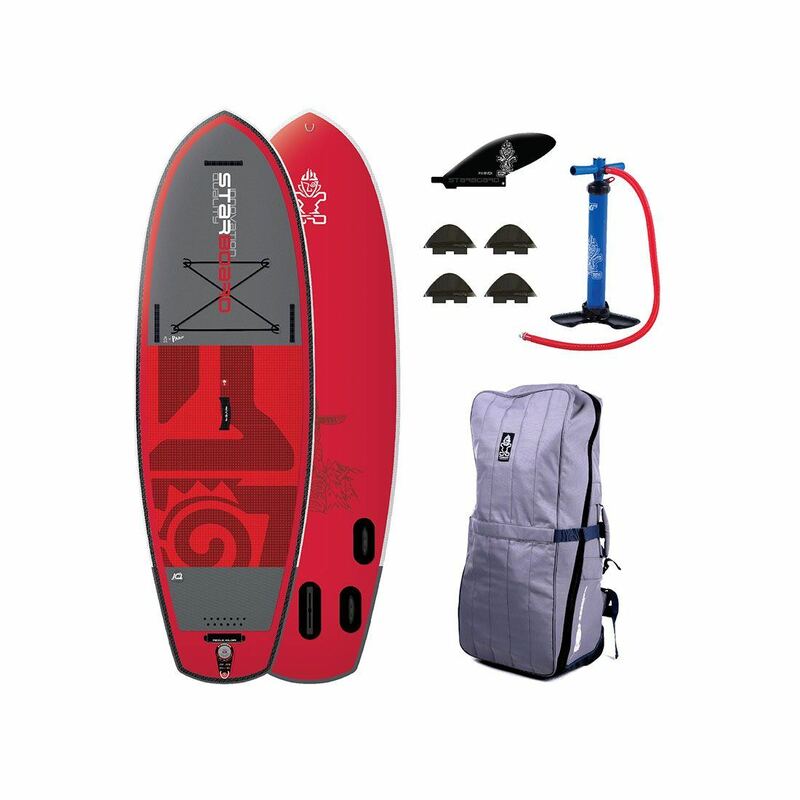 The board again features a front cargo area with included bungees, indestructible glued on rear fins, the same padded center handle, the same rear handle that doubles as a paddle holder, and the same nose mounted (underside) and rear mounted d-rings (for your leash). 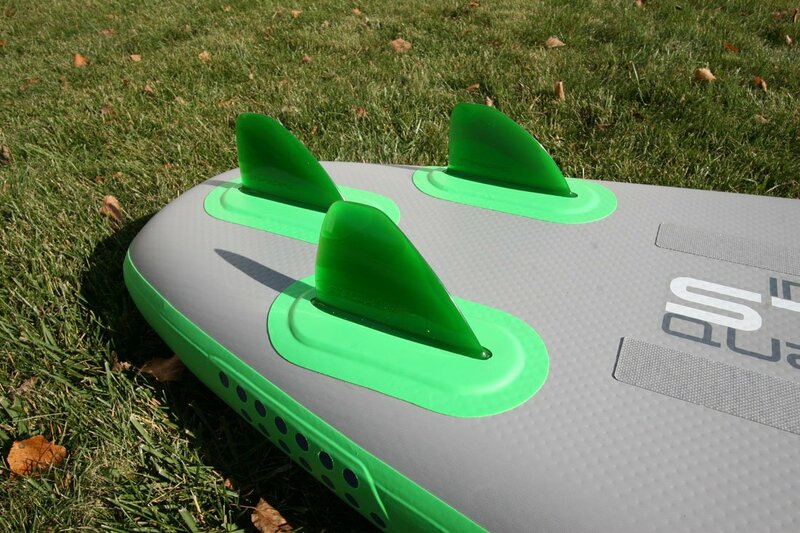 The large thruster-fin Flex-Fin set up is a proven and durable tracking solution. 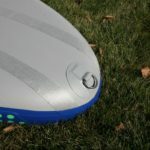 Not apparent in the above comparisons, but visible in the gallery images are the standing area plates which are extra layers of PVC underfoot which help spread the load of the paddler. 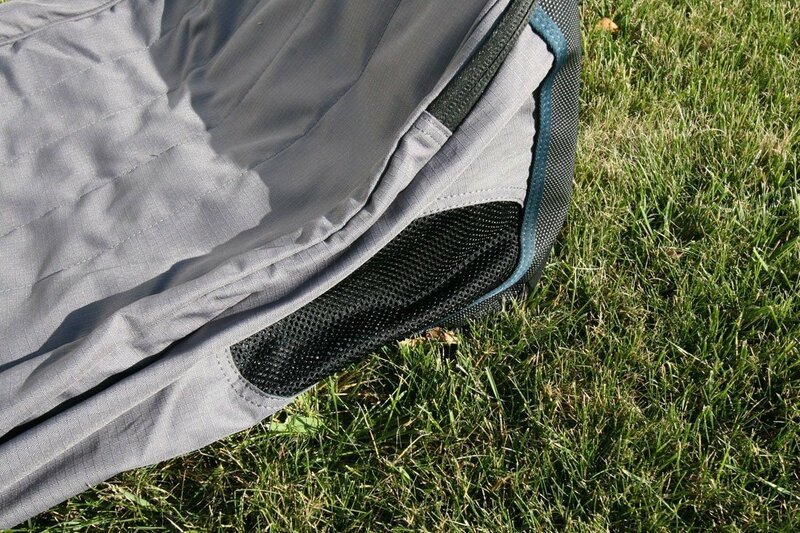 Also not visible are the new triple sandwich rails with stiffening strips. 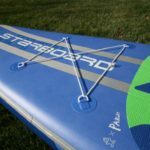 Also carried over from 2017 is the exclusive and innovative lightweight Starboard SUP leash. 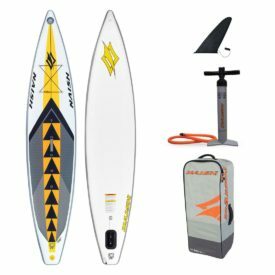 It will be your best paddling partner in flat water and touring conditions. 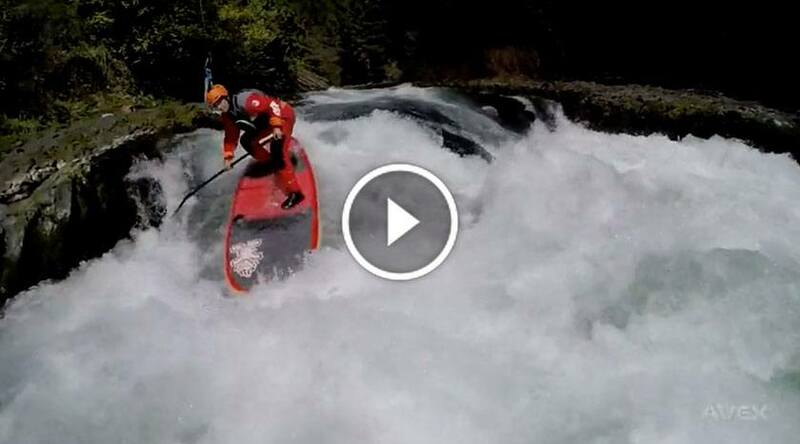 Leash is NOT suited to waves or white water. 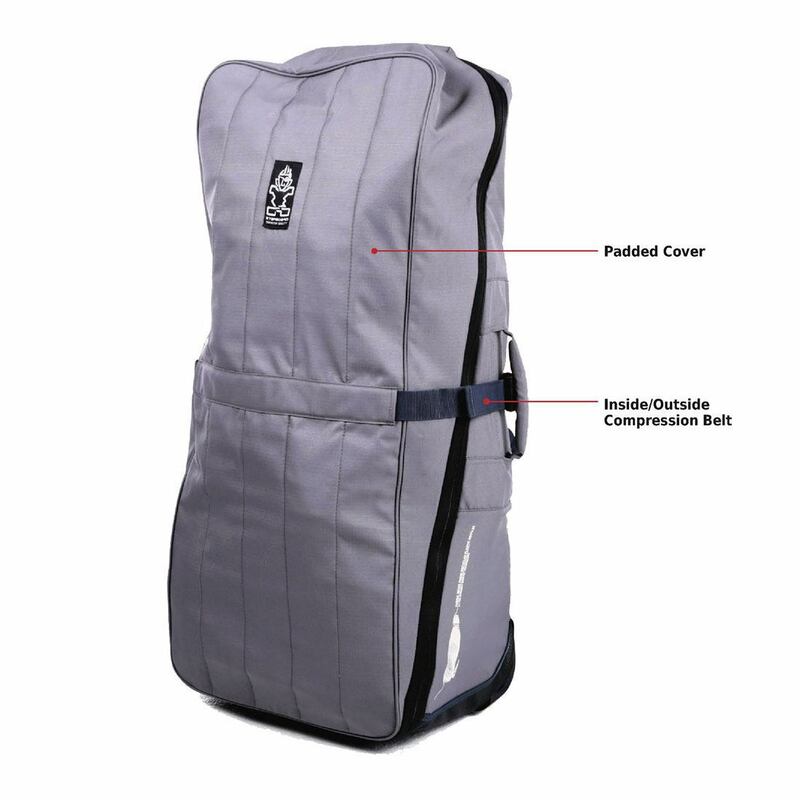 Compact in design and at only 70g, it is strong, comfortable and effortless to wear. 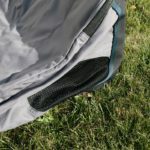 The package includes a repair kit with glue and patches, and a general guide book with inflation instructions, pump tips and care tips inside the mesh pocket. 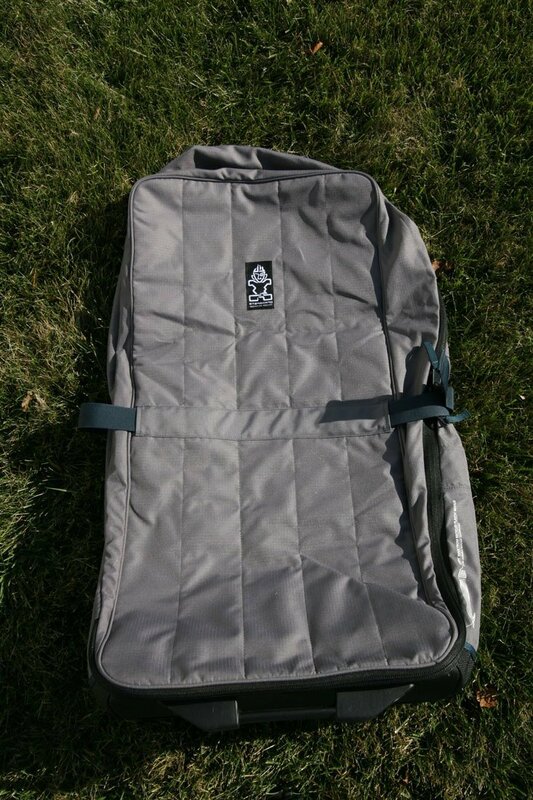 Finally, a cinch strap to keep the board rolled up. 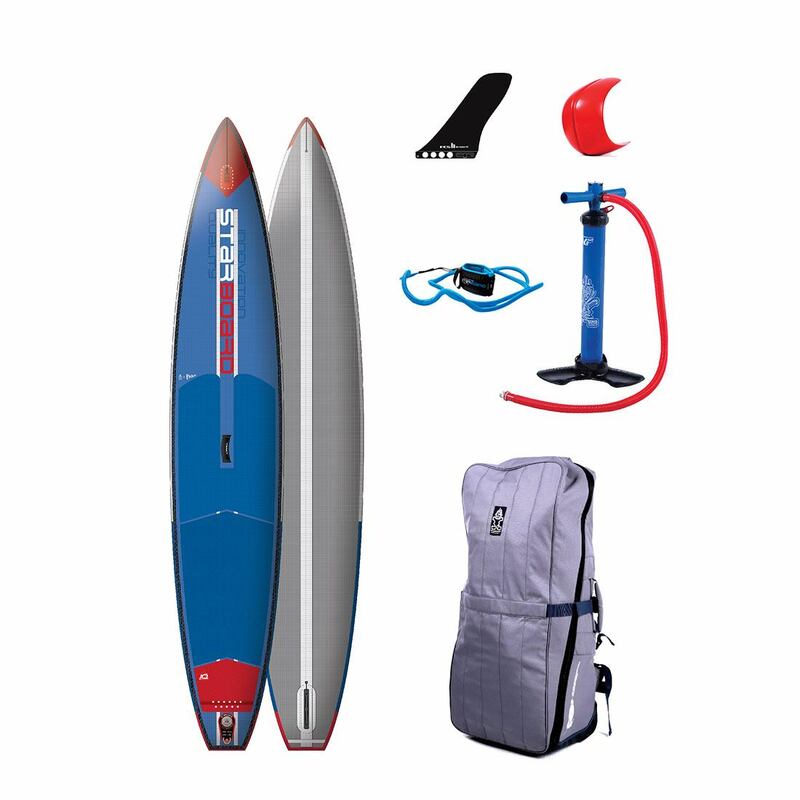 This board comes with Starboard’s Re-Cover Zen SUP board bag, V8 Double Action High Pressure Pump, lightweight Starboard leash and a small repair kit. 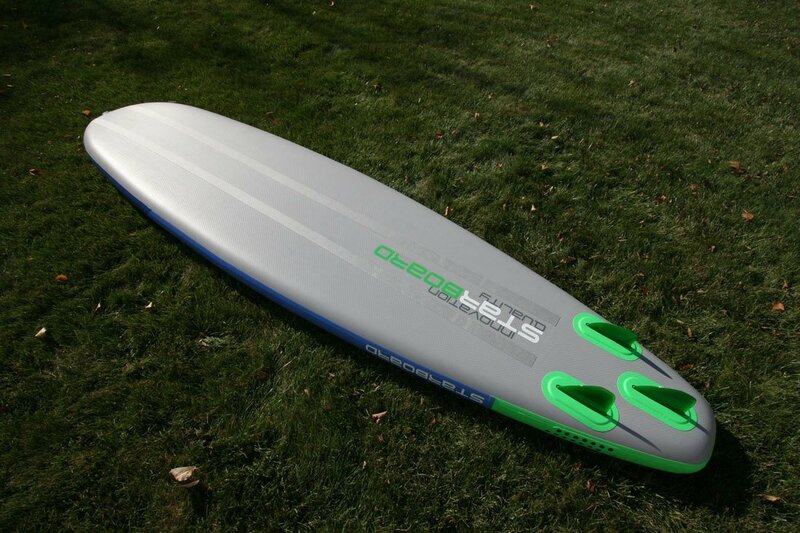 The board blends abilities to perform in most conditions. 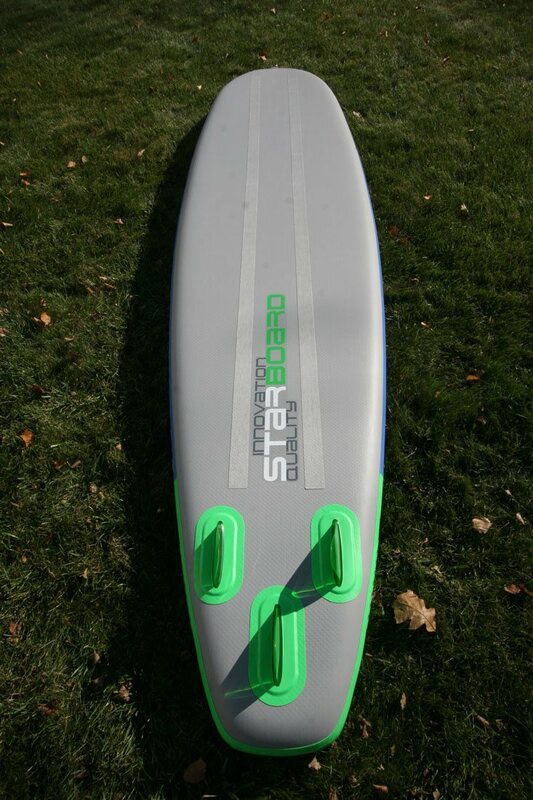 A great all round size at 11’2″ x 32″, it offers great glide and stability, and carries good speed. 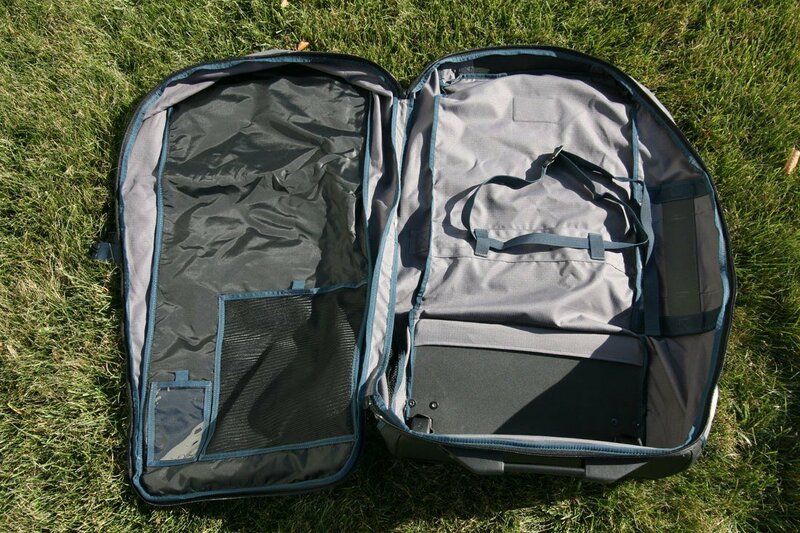 Not too long, it is easy to manoeuvre and handle, and still quite light at just 22 lbs. 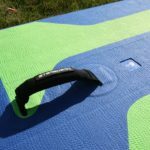 The step up from 4.75″ to 5.5″ thick, along with 18 PSI of pressure, the stiffening strips and standing area plates, they all combine for greatly improved stiffness and performance. 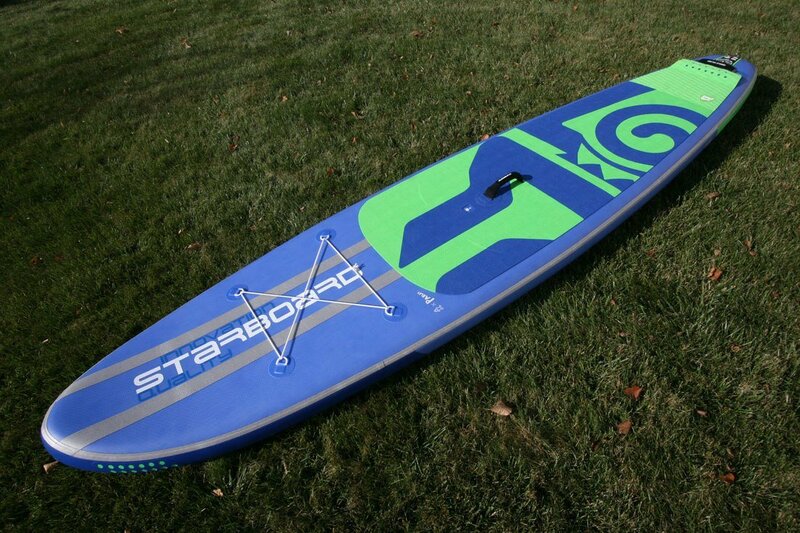 Where on last years model I was up near the weight limit of 190 lbs, this year’s board can handle 220 lbs. 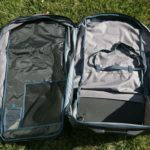 What does being able to carry more weight mean? 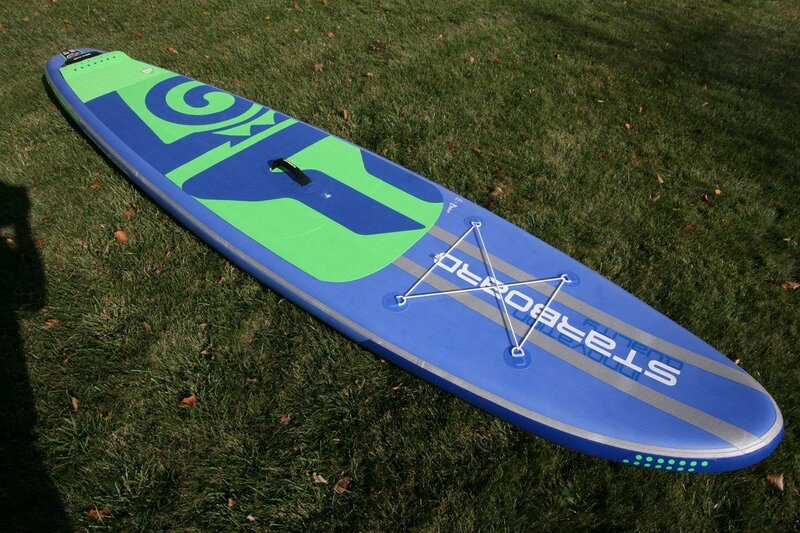 It proves that the board is stronger, stiffer and more capable than in previous years. 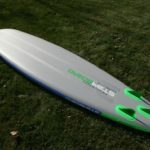 So at any given weight, the board will be more rigid and perform better on the water. 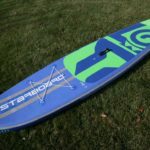 The wide-ish nose area provided great stability in my usual choppy conditions, while the tapered tail area still offered good glide and speed. 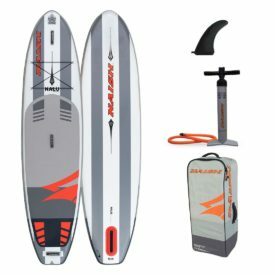 Many all round style boards have really wide tails which creates a lot of drag, great for stability, but slow as heck to paddle. 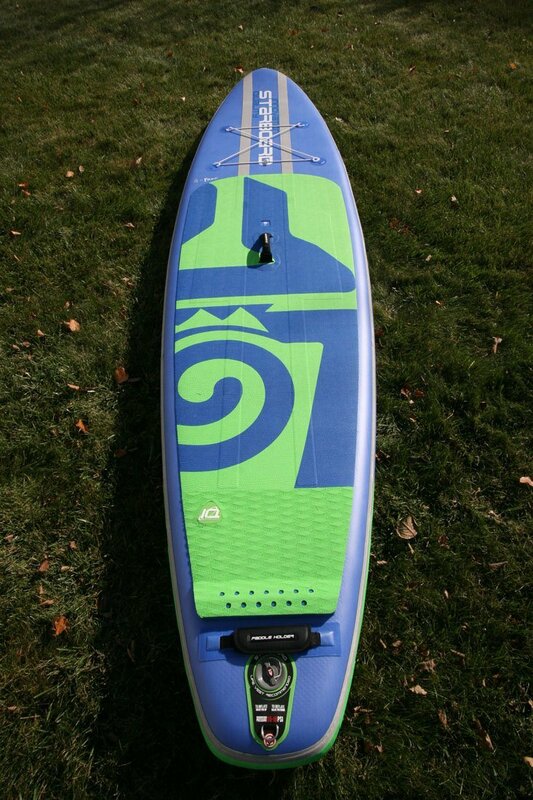 I like the mix on the Blend of forward stability and tapered tail with ability for faster paddling. 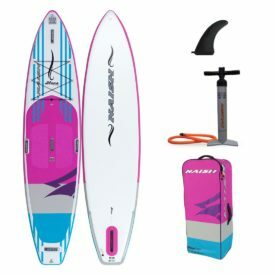 The fins are bomb proof and will handle all kinds of abuse, however, I would prefer a little more tracking from a larger fin system with a board of this size. 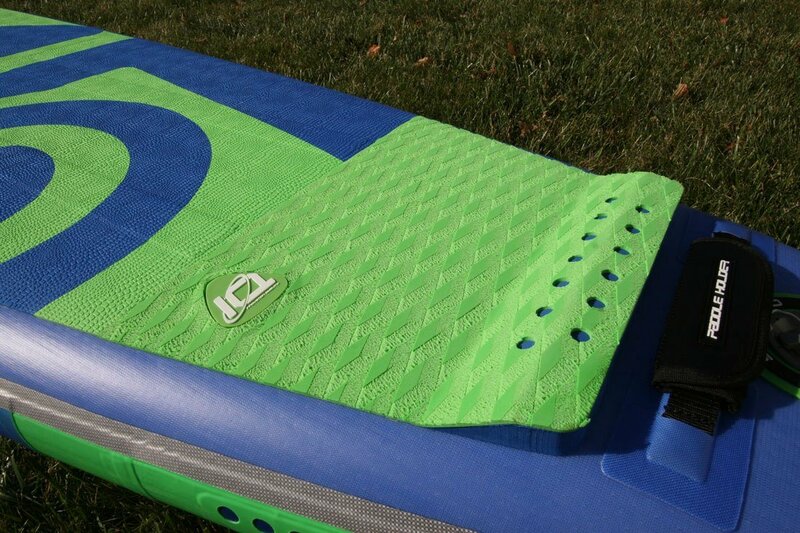 The deck pad is very comfortable. 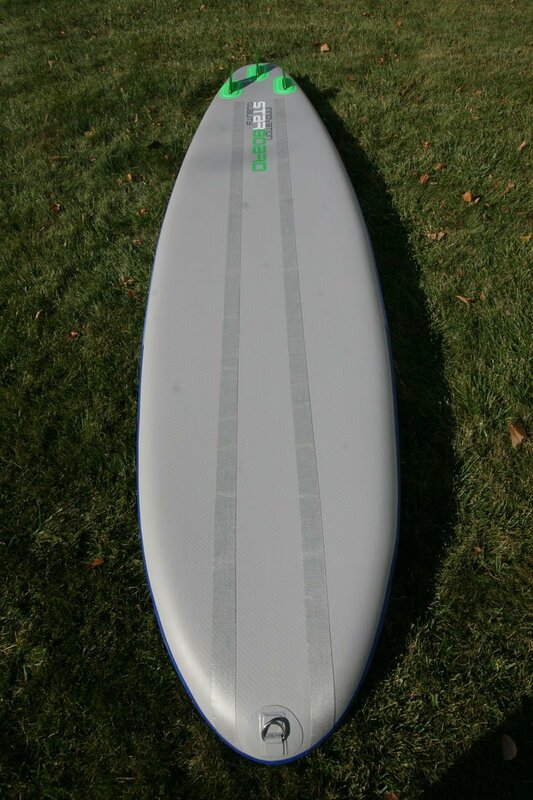 Lightly textured in the main area with a diamond cut tail area (green), it provides lots of grip with rail to rail coverage. 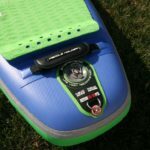 Tail mounted handle is a great feature for dragging the board in and out through small breakers. 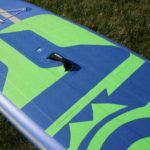 The underside nose mounted d-ring offers a great place to anchor the board, tie it off to a dock or do gentle towing from. 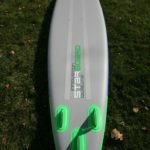 Improved for 2018 with updates to the Zen construction and board thickness, the 2018 Starboard 11’2″ x 32″ x 5.5″ Blend Zen is an excellent quality, versatile and durable all round to wave rider to cruising board. 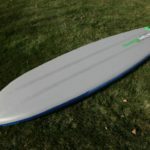 The 11’2″ Blend has good glide, is very stable and has all the required features. 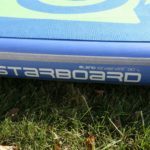 Starboard offers extremely good value for money with their Zen boards and when you factor in the known quality of the Starboard brand, the $999 price for this Blend Zen is really a steal for this level of quality and performance. 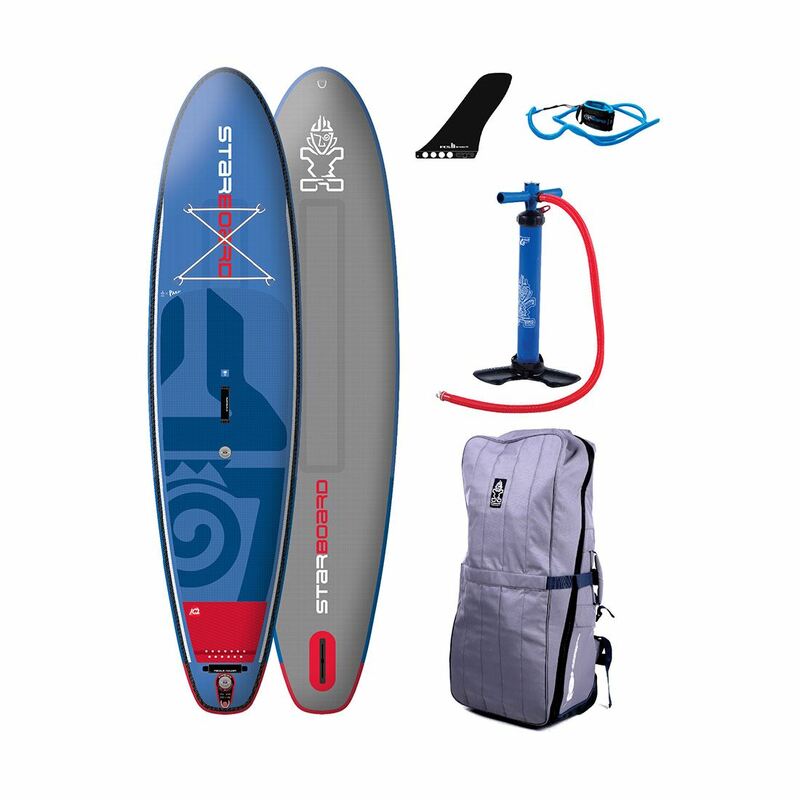 Find all the details here: Starboard 2018 Blend Zen 11’2″. If you can’t decide between the 11’2″ x 32″ Blend, the 10′ x 35″ Whopper Zen, the 10’5″ x 30″ Drive Zen or the 10’5″ x 32″ Wide Point Zen, give us a call: 1-888-252-4983. Posted on July 29, 2018 by Julian Kidd. 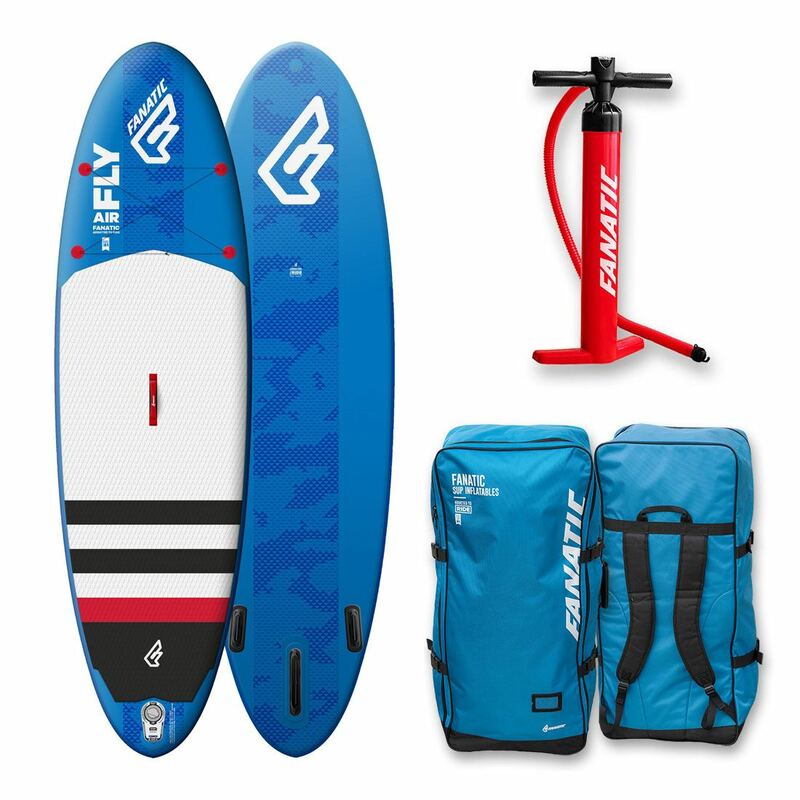 I’m very impressed with the board’s quality and the fast shipping time. Thanks Julian! I’m impressed with your service! 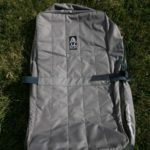 You’ll be getting more orders from me, my family and friends. 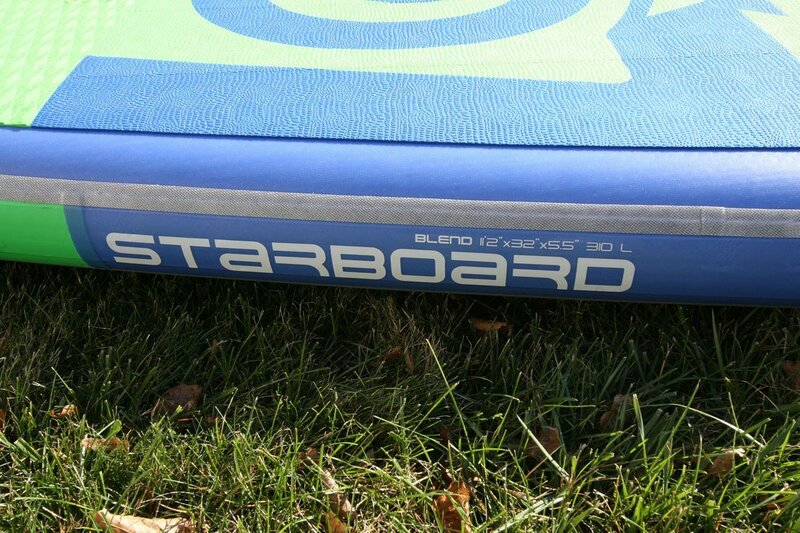 Thankful to Starboard as well! It generally pays to stick with trusted brands!